Pear-Shaped and Round Diamond Vintage Infinity Swirl Engagement Ring | Shane Co. This breathtaking engagement ring is crafted of quality 14 karat white gold and waits to hold the center diamond of your choice. Two pear-shaped diamonds (approx. 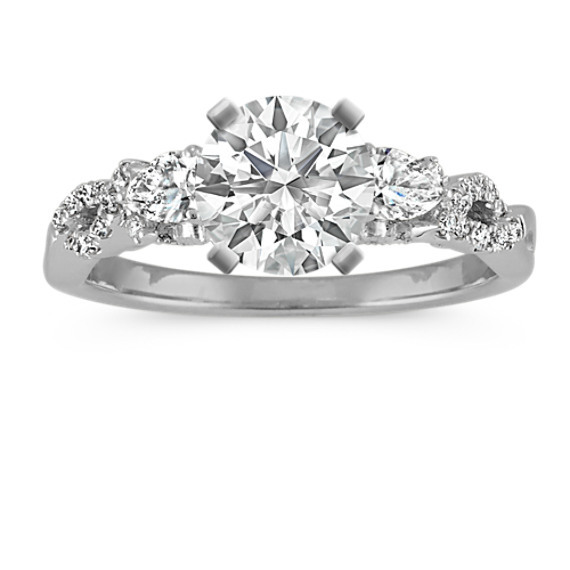 .26 carat TW) accent on either side of the center setting while 24 round diamonds (approx. .13 carat TW) are pavé-set to accent the infinity swirl of this design and the profiles are complete with vintage-inspired milgrain detailing. The total weight of this engagement ring is approximately .39 carat and the ring measures 3.5mm wide.